All labs have a "proximity card reader" system installed. This means you should be able to access the CS labs, even after hours, using just your onecard student ID. All students currently taking CS courses should automatically have their card activated to allow access to the labs. During business hours (9am-5pm), if faculty and staff are around, we will leave the doors open. After 5pm, or whenever the last faculty/staff member leaves, we will shut the lab doors and you will need your student ID to get in. 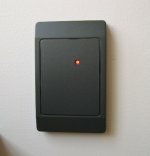 There is also one outside door equipped with a card reader (the door between Martin and Cornell). Public Safety usually locks the outside building doors around midnight. After this happens, you will need your student ID to get into the building. To use your prox tag, just hold it next to the card reader for about 3-4 seconds. You should hear a beep, and the light will turn green. The light on the panel will stay green for about 5 seconds. During this time, the lock should be open, and you should be able to just push the door open (ie, you don't have to turn the handle). Please be safe. If it is at all possible, don't work alone late at night. Please don't prop the doors open after hours. If you're the last one out, please shut the doors. Let onecard @ swarthmore.edu know immediately if you lose your tag or it doesn't work. Please don't share your tag (or your CS account!) with others. If you have any questions or concerns about this system, please email local-staff.